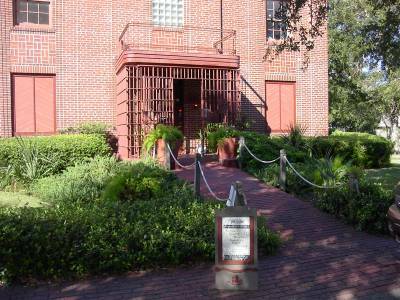 The Amelia Island Museum occupies the old jailhouse. According to Carmen Godwin, Director, the museum was in use as a jail until 1978. "My office is in maximum security." She pointed to the grooves remaining in the ceiling of her second story office. "You can still see where the bars were and where they've been removed." The permanent location of the museum is the result of a migration of the Decker Collection of artifacts from the old schoolhouse and the old railroad depot. ?Volunteers took out the bars and converted the museum in 1986. Deon Jaccard pulled volunteers together and made it into a spoken history museum. We have guided tours at 11 a.m. and 2 p.m. The spoken history turns about eight flags. We?ve built up attendance and made it a very successful museum.? In December 2002, the museum closed while professional designers remodeled the layout of the first floor. It reopened in April 2003 with new exhibits. "We're not ADA accessible on the second floor, so we had to keep the exhibits on the first floor," Godwin said. At present the second floor is reserved for offices, library and archives. She hopes that with additional funding, an elevator will provide access so that exhibits can be set up in the second floor as well. "Some people want someone to tell them the story," Godwin said. "We have 35 docents who take a week-long course of history, but they don't get a script." She pointed out that the guides are free to give their talks a personal touch. In all, about 150 volunteers help with various museum needs. According to Godwin, from the claim of Florida by the Spanish to the present day, Amelia Island has been under the flags of eight different nations. Fernandina Beach is also noted for its role as a haven for pirates, and that is part of the 8 flags tour. In the early 1800?s, when that part of Florida was under Spanish control, the area was a base for smugglers and pirates. Even though the United States outlawed the importation of slaves in 1808, slave ships using the port at Fernandina continued to operate until the trade was shut down. Godwin said, "The museum's aim is to preserve and share artifacts from our past and provide a research library with reference materials pertinent to Amelia Island." For instance, a section is devoted to the now extinct Timucuan Indians, who were native to northeast Florida. Other exhibits highlight the fishing industry, Spanish missions, and other phases of Northeast Florida history, including the Civil War and the famous Kingsley Plantation. Anna Kingsley, the African princess taken as a slave who became the wife of planter Zebadiah Kingsley, helped him manage plantations in Orange Park, Ft. George Island and other locations. The plantation on Ft. George Island now exists as a museum, also open for tours. The Amelia Island Museum of History offers a school tour program for fourth graders in Nassau County through Frease Foundation, who pays for the transportation. That is the year local students learn about Florida history, and the museum gives them study materials that meet Sunshine State standards. 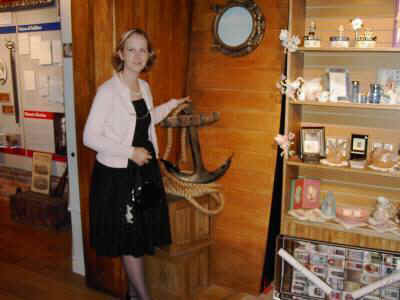 For further information on the museum, log onto http://www.ameliaisland.com or call 904-261-7378. Article first published in Clay Today Newspaper.